Home Latest News DAAP leads the way! Back, left to right: Base Services Manager David Marshall, Captain Brian Delamont, Workpower Social Enterprises Executive Peter May, Calib Bornhede, Deputy Director Commercial and Government Gary Watson, and Workpower CEO Lee Broomhall. Front, left to right: DAAP Co-ordinator Eoin McConnon, Lyn Goodfellow (front), Tyler Gould, Project Manager Shipbuilding & Scanning James Simpson, Garrick Snell, Andrew Ferry, Emma Dawson, and DAAP Supervisor Kelly Wayne. 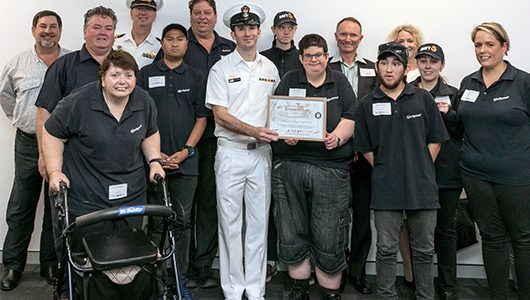 On 24th October, HMAS Stirling received an award for their fantastic work fostering employment for people with disability. This includes their work with our DAAP team on Garden Island! Commanding Officer Captain Brian Delamont received the award from the Minister of Disability Services, Hon. Stephen Noel Dawson MLC. The certificate recognises their commitment to equality, diversity, and providing opportunities for individuals with disability and mental illness to engage in meaningful work. “It has been great working the DAAP team. We are committed to creating a work environment that values, respects and is inclusive to all,” says Captain Delamont. The Navy chose Workpower to establish the Western Australian Defence Administrative Assistance Program (DAAP) in June 2016, and they’ve been going strong ever since. The team provides administrative support to the naval base and their work has led to the creation of an inclusive work environment where the DAAP team work alongside Defence employees. As always, the team are leading the way for Workpower and we couldn’t be more proud of the great work they’ve done! Workpower is a part of the Western Australian Disability Enterprises (WADEs), one of eight organisations who provide opportunities and employment for individuals with disability and mental illness. Their work foster social outcomes, covers a range of industries, and produces high quality products and services. Congratulations to the HMAS Stirling for their commitment to inclusion. And thank you to Lieutenant Will Singer for providing these details. For over 20 years, Workpower has strived to create opportunities for individuals with disability. We support people and their families and carers on this journey. Contact us here or at (08) 9445 6500 today.